The burly security guard at the entrance of the Regent Beijing Hotel is not a music industry enthusiast. But he knows who Jay Chou is. Thus, when he is put on duty during a recent news conference involving Chou, he is elated. His mission is to keep order as nearly 200 fans swamp the hotel entrance and to lead them to the ballroom where Chou is scheduled to launch his new album, Opus 12. When I approach him and show my ID, he whispers, "He is still cool!" Chou would have been pleased to hear that because the Taiwan mega-pop star is nervous despite having sold more than 24 million CDs during the past decade. "After having been in showbiz for 12 years, releasing my 12th album means a lot to me. I am nervous. Maybe it is middle-aged crisis, which has come early for me," he jokes. "Women are scared about getting old. Men too. I don't want the young fans to call me uncle. I want to be called brother." Chou made his debut in 2000, when he released his first album, Jay. Since then, he has released one album every year except in 2009, selling several million copies each time. His music has gained recognition throughout Asia. Chou also runs his own record company JVR Music. But even for veterans like Chou, he knows that it is hard to raise eyebrows as this is a challenging time for the music industry and there are new faces every day. Chou has had his share of cold receptions. In 2011, Chou released an album, Exclamation Mark, which did not sell well. Before that, his first Hollywood attempt starring in a comedy-action movie, The Green Hornet, also received negative reviews. "People told me that I looked terrible in the movie, a little fat and blank," he says. "I can feel the disappointment. People are watching me and waiting to see what I have to offer next. It's like when I released my first album." Describing himself as an emulative and stubborn person, Chou decided to start rebuilding his image. He engaged Kevin Lin, a marathon runner from Taipei, to be his personal coach. Within six months, he lost nearly 10 kilograms and had a better-toned physique. Looking in the mirror, he feels good. "Lin had a record of running in the desert for four days without sleep. 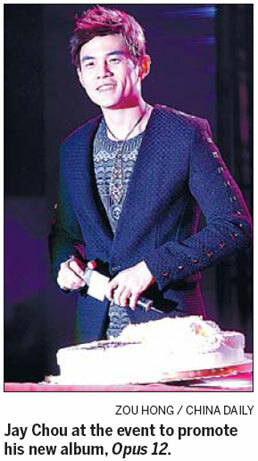 He is the symbol of willpower," says Chou, who celebrates his 34th birthday on Jan 18. "Working with him made me feel refreshed and powerful. I want to bring the same energy into my music again." Almost half of the promotional pictures for his new album show Chou's muscle-toned upper body. But Chou says what's more important is the content of the album, which returns to his popular Chinese-style R&B. One of the songs in his new album, Red Dust Inn, reminds listeners of his popular hit Chrysanthemum Terrace, and Ukulele's light-hearted melody bears similarity to his song Listen to Mother's Words. "I don't want to be an artist confined to the studio. I want my works to be seen and enjoyed by people," he says. Fans can feel the young energy in Chou's latest album, just like his new body. One unique feature remains: The album has Chou on his piano just like his previous CDs, with lyrics from Vincent Fang, who is known for his poetic lines. So far, the response has been positive. According to Chou's record company, Sony Music, the new album sold 200,000 copies within a week after it was released on Dec 27, 2012. He will kick off his 2013 world tour in May from Shanghai. Nearly 30 shows have been booked by performance companies across the world. Chou's second directorial film will also be unveiled to audiences in May. With no concerts in 2012, apart from music, Chou was involved in hosting a TV show and shooting movies. "But it didn't mean Jay Chou was leaving or resting," he says firmly. Compared with his early days in showbiz, Chou says he has become more talkative. But, he still wears his trademark cap sometimes.